In our 2016 moment, Instagram has become the coin of the realm. Instagram and other social media make or break individual careers and define culture. If Instagram can motivate many thousands of people to flock to, for example, The Broad Museum in the Grand Avenue Arts District in Los Angeles, to selfize in Yayoi Kusama’s Infinity Room, that’s great! Of course, many of them will never fully appreciate the depth and resonance of her life and work, but if even a few do, that’s fantastic! Then again, do we really need 10s of thousands of selfies of different people taking their turn in the same photo op? Rebecca Nguyen from Toronto, Canada and I were discussing this concept during her visit to RULA. I decided to document a day of tourist sightseeing with Rebecca & Kamal not through our own photos, but simply by surfing the net for other people at the same places and doing the same thing we did. The resulting document is everything we did but through other eyeballs. With Instagram, perhaps there are no roads less traveled. And if we’re on well-travelled roads, do we really need to take the same pictures over and over? 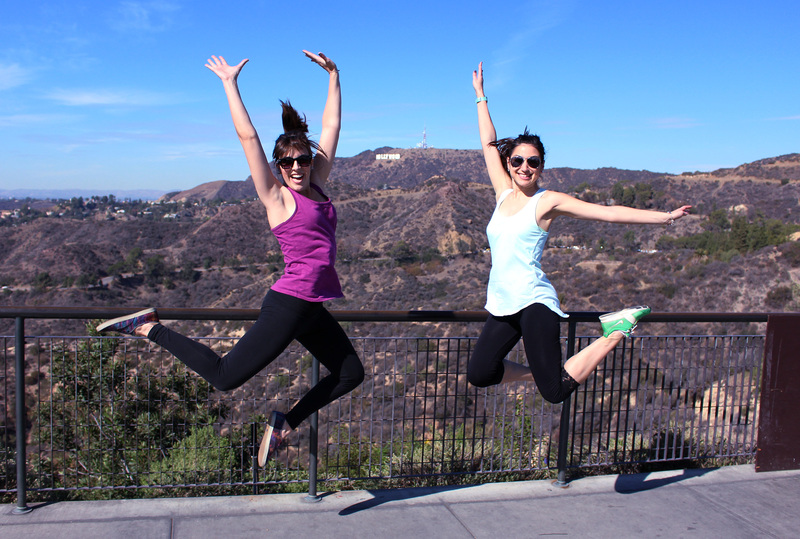 “Kamal & Rebecca” at Griffith Observatory jumping in the air with the Hollywood Sign behind them.